I’m slowly digging this stump out and plan to move it to my house, where my greedy hands will then pressure wash and store it until I can make something cool out of it. How long will it take this to air dry? I don’t want to cut it in to small bits, I’d prefer to keep it whole and make an artsy table, etc. By the way, this is not an easy job. 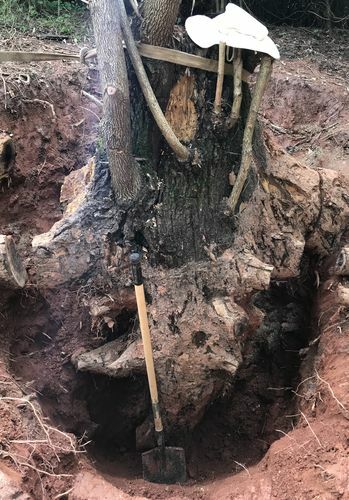 This stump is 75 yards into the woods, no power, no electricity, so I’ll be wenching it through some woods to get it to a place where I can load it on a trailer. How long will it take this to air dry? That’s a little longer than I planned. Wow! I am envious, and not envious. That is a lot of work. After you get it out of the ground, I would anchor seal any cut ends, and store it in the shade/barn. I have not processed a stump before, but have done it with some logs for turning. Anchor seal is amazing, if done right away, you won’s see checking for months left outside, in the round. Since I haven’t processed a stump before, I am not sure what the pith is like in a stump. I would cut out the pith, or at least get close to it to relieve some stress. Again, anchor seal at least the end grain. When you’re done with the wench, send her to my table, I’m getting thirsty…. Just Kidding (about the wench, not about being thirsty). That sort of manual labor has lost it’s appeal to me many, many years ago. 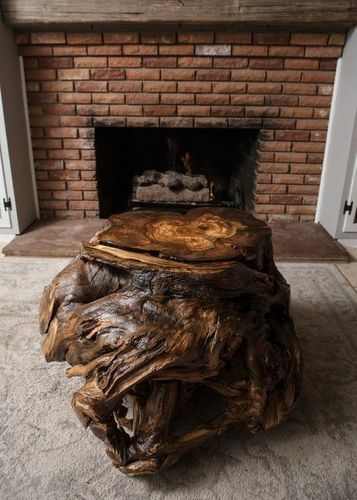 Probably take a number of years to get that hunk of wood dried out to the point you can do something with it. You might hasten the drying by ‘chunking’ it out some and sealing the end grain. 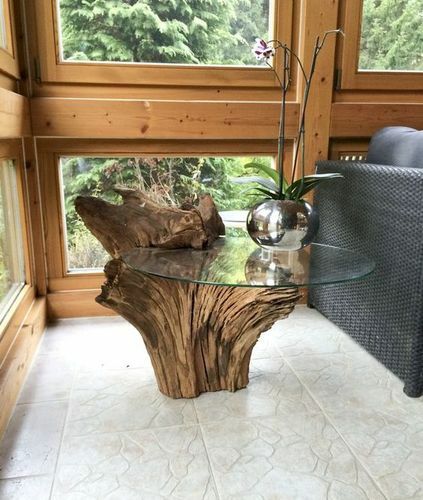 What kind of table are you looking to make with it? I am up for ideas. I figure I have a lot of time to decide, but something like a large coffee table or even some sort of table that sits at the end of a sofa, or in a hallway. I liked these that I found on the www. Do you know what type of walnut is it? Not knowing what type of table you wanted to build, I was going to recommend getting it slabbed up awhile too. You could also try and find someone with a kiln that would let you stick it in there. I’d guess quite a few years for that thing to dry out in it’s current shape. Since the “wench” is me (not looking like Hack’s wench, as in bald guy with a gray beard) I’m not trying to save my back. I’ll take my time and use my come-along, and save my back hopefully. I’m feeling pretty devoted to getting it out in one piece. And if I burn through a few chain saw blades, it is expected. I don’t know the type of walnut tree. It’s in northeast GA, and I can post a picture of the table made with the wood. Or I can take a picture of a neighboring tree that is still standing (no leaves on it at this point). Can it be identified by the bark only? Did you use any finish, seal ends, etc or just leave alone to dry out? Osu, on most I used pure tongue oil and tried to slow drying. Some linseed oil. Moisture will build on the bottom side, so either shim up or flip once in a while. Build your table now and then let it dry but be ready for some movement and cracks or you might just get lucky. 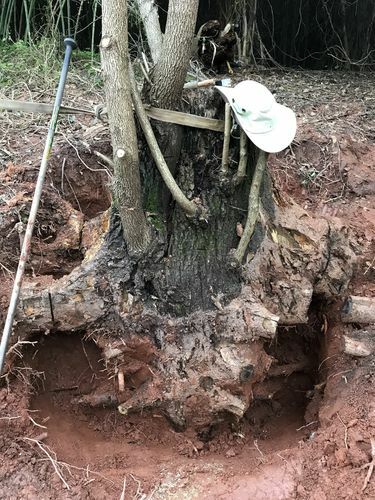 Just updating y’all on the stump status…. I think I’m going to have it milled vertically, so I could possibly have the option of 2 tables. The tap root has a fork in it that you can’t see in this picture, but the other half is about the same size as what you see here. It’s a little over 4 feet wide at it’s widest point (from cut to cut).